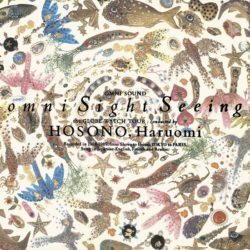 Omni Sight Seeing, originally released in 1989 during YMO’s initial hiatus, is an exhilarating musical journey around the world as filtered through Hosono’s kaleidoscopic lens. This work stands as a manifestation of his concept of “Sight Seeing Music,” putting his own tasteful spin on the “world” music encountered during his explorations of global cultures. From Japanese minyo and Algerian rai, to American swing jazz and the self-described, extraterrestrial “Ether music,” his eclectic influences coalesce into a sound that is unmistakably Hosono’s, and many consider this album to be the perfect summation of his mastery of pop music forms. Partly recorded in Paris with assistance from producer Martin Meissonnier (Don Cherry, Fela Kuti) and contributions from French-Tunisian singer Amina, omni Sight Seeing includes the mysterious “Orgone Box” (inspired by Wilhelm Reich and Steve Reich), the acid house “Laugh-Gas” (inspired by Rococo and the French Revolution) and the serene fan favorite “Pleocene” (conveying an “oceanic feeling”).